Tyler and Andre are two 12-year-old Texas boys who get inspired one night by a drunken rant of Tyler's father against immigrants and Obama. 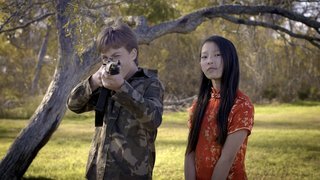 Armed with only their bikes and their BB guns, they set out early the next morning to ride to the capitol and secede from the Union, but their plans soon get derailed when they run into their Chinese classmate Jenny. Jay Hubert began his professional career as a DP in China after studying in the prestigious cinematography department at Beijing Film Academy. He shot and/or directed a number of commercials, documentaries and promos for clients such as Apple, Volkswagen, Peugeot, Intel, Lenovo, China Unicom, Bud Light, Vice, Nylon, and Xiaomi, while also working on several Chinese feature films. In 2013 he served as Director of Photography for Volkswagen Group China's "People's Car Project -Building the Car Series," a 10-episode web series awarded a Gold Lion at Cannes Lions. Over the course of the past dozen years, Hubert has written and directed over two dozen short films, many of which have screened and won awards at international film festivals. He is fluent in Mandarin and Japanese, and conversant in Cantonese and Korean. The Secession follows two young Texas boys on their mission to secede from the United States, and how they have to confront their prejudices on the way. Writer and Director Jay Hubert answered some questions for us about the message of his film and why he chose to use child actors to tell this story. Read the Full Q&APBS: What was your motivation for using children to send the message that you did about acceptance of other cultures, ethnicities and so on? Jay Hubert: Moving back to Texas for grad school after living abroad in Asia for most of the previous 15 years resulted in some challenging and narratively inspiring manifestations of reverse culture shock. Most notably, with all the attention the "immigrant crisis" was getting in the news, I was a bit disturbed at the negative stigmatization that had been attached to the word (and the concept of) immigrant, but thinking back to my childhood realized this had always been a tricky subject for Americans, and for Texans in particular. I also had to laugh at the absurdity of the fact that as a kid growing up in Texas, the word immigrant was invariably linked to the word Mexican in my mind. With these thoughts bouncing around in my head, and with the media increasingly shining the spotlight on Texans signing petitions to secede from the Union under Obama’s administration, I came up with the idea of two young Texas boys armed with BB guns riding their bikes to the state capitol to secede. While I can't claim having attempted such a feat in my youth, given all the other ridiculous things I did as a kid growing up in Texas (often times involving BB guns and bikes, sometimes in wonderfully dangerous combinations), in some ways the events of this film are autobiographical in nature, and drawing on some of the crazy experiences from my own youth was a large part of the motivation to use children as the main characters of this film. The larger motivation in telling this story through the eyes of children evolved from the idea that their opinions and views on the world are much more malleable than those of adults, and much more open to change. That’s why it’s so much more crucial that children have good influences and eye-opening experiences at a young age to help shape them into responsible and well informed adults. At the same time this film approaches this idea in a comical and satirical manner, showing how the biased views of adults can be greatly distorted and misunderstood when viewed through the filter of childhood naiveté. In seeing the childrens’ actions play out as an amplified manifestation of the desires of their adult idols, it’s much easier to show the absurdity of those desires than if the adults were the ones to carry out their plans themselves. KLRU-TV, Austin PBS is dedicated to telling stories that entertain, inspire and change our lives. KLRU highlights what makes Austin unique –whether music, arts or public issues –by creating and distributing award-winning original content. KLRU produces several series including Austin City Limits, Arts In Context, Central Texas Gardener and Overheard with Evan Smith. As a nonprofit educational organization, KLRU also prepares children to succeed in school and creates lifelong learning opportunities for all.